I began the summer focus series on the Twelve Apostles of Jesus last week starting with Andrew. Did you enjoy learning more about him? Today, I’m turning our attention toward Peter. The biblical information written about Peter is lengthy, therefore, I’m breaking down his story into two parts: Peter’s time with Jesus and Peter’s time after Jesus. On Wednesday, I’ll provide some helpful links to assist you in learning even more about this extraordinary man. In every biblical listing of the apostles, Peter is the first man recorded. This position, as most scholars support, highlights Peter as the leader of the Twelve Apostles. His Hebrew name, Simon, contains a root word within it that means “to hear.” Throughout the New Testament, Peter does take on a leadership role within the group and display burgeoning leadership skills. These attributes of his character strengthen his position as leader in addition to the listings. When John wrote this encounter between Jesus and Peter, the Greek word he used for looked in verse 42 is the word emblepo. This word means to observe fixedly, to discern clearly, to behold, gaze up, or look upon. The way Jesus looked at Peter could also be described as “a concentrated intent gaze, the gaze which does not see only the superficial things that lie on the surface, but which reads a man’s heart.” In colloquial terms, Jesus knew Peter better than he knew himself. 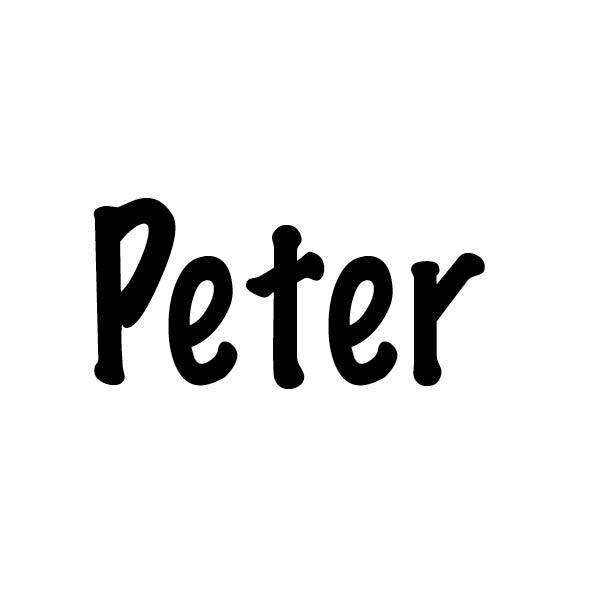 Jesus saw a big dose of faith potential in Peter. So, Jesus changed his name to reflect the big “P”- potential he saw in Peter. From that day forward, he would be known by the Aramaic name, Cephas, which means “rock.” The English name Peter is derived from the Greek – Petros. After following Jesus for a period of time, Peter is inspired to proclaim his thoughts about Jesus when asked. A play on words is taking place in the Greek in this passage. Jesus calls him Peter/ Petros: a (piece of rock) but then states that “on this rock” which uses the Greek word: petra meaning a (mass of) rock, a cliff, ledge; he will build his church. Opinions are varied concerning the rock upon which the church is built. Some scholars suggest Peter’s confession of faith in Jesus as the Messiah. Others suggest Peter himself. While still others support the notion that the rock is Jesus. Peter was a man of action, impetuous, passionate, and quick to speak. Shortly after he chose to follow Jesus, he had an experience that totally astonished him. Jesus asked Peter to let down his nets in deep water to catch fish. He tried to reason with Jesus that the fish weren’t biting but Peter humors Jesus who in turn humbles him. Not only did they catch fish but they caught an overabundance. That day was an object lesson for Peter (Luke 5:1-11). Peter also initially balks at the idea of Jesus washing his feet. The chore was usually left to the dinner host’s servant but at the Last Supper, Jesus assumes the role. Once Jesus explains the purpose of the washing, Peter, in his indomitable style, asks for his whole body to be washed (John 13:1-17). Peter’s affection for Jesus was gregarious. The story about Peter that has captured many a schoolchild’s imagination in church is the story of him walking on water. Following the supper meal on the hillside with a crowd of five thousand plus, Jesus sends the disciples on ahead to cross the lake while he dismisses the crowd. The disciples were almost to the other side of the lake (John 6:19) when during the early morning hours, they see Jesus walking on the water. Yes, Peter had plenty of bravado and courage but his faith needed to grow. Jesus also often took Peter, James, and John aside to accompany him to places the others never went. These men watched in astonishment as Jesus brought Jairus’s daughter back to life (Mark 5:21-43). They also stayed close by to watch and pray as Jesus, overwhelmed with sorrow concerning the events soon to take place, prayed in the Garden of Gethsemane shortly before his crucifixion (Matthew 26:36-46). Another time, Peter was trying to be helpful, or he possibly had a bad case of talking to cover up his nerves, when he, along with James and John, went with Jesus up the mountain. They beheld Jesus transfigured before their eyes. Peter, so quick to deal with the situation, almost missed the moment. God had to tell him to hush. Peter wanted to be informed and wanted to understand. When Jesus begins to speak on more difficult topics, some of his followers abandon him. Jesus asks the Twelve if they too would quit following and Peter responds; “Lord, to whom shall we go? You have the words of eternal life. We believe and know that you are the Holy One of God.” (John 6:68-69). Also at the Last Supper, Peter can’t stand not knowing to whom Jesus is referring as the betrayer. So, he leans over to John nudging him to ask Jesus (John 13:21-27). Peter, because of his bold nature, probably found himself many times needing to ask for forgiveness or to give forgiveness to others. He asks Jesus how many times he is to forgive a brother (Matthew 18:21-22). Peter searched for wisdom and understanding of life and how to follow Jesus rightly. Peter’s heart was in the right place but his actions often were not. He loved large. Peter, trying to protect Jesus from arrest, swung a sword cutting off the ear of the high priest’s servant in the Garden of Gethsemane (John 18:10). One of the times Jesus spoke of his impending suffering, dying, and resurrection, Peter took Jesus aside to set him straight. He felt he knew better than Jesus what was best for him which prompted Jesus to call him Satan (Mark 8:31-33). But Peter faced an even tougher challenge to come. He quickly insisted to Jesus that he would never betray him when Jesus told him that Satan wanted to sift him and the other disciples like wheat. Peter was certain of his faithfulness but Jesus told Peter that he would deny knowing him three times before the rooster crowed. Peter knew he would be faithful to the end but when reality came, Peter became a broken man aware of his own weakness. Yes, Peter denied but he was quick to run to the tomb (Luke 24:9-12). He longed to see Jesus and be restored in fellowship with him and Jesus gave him that opportunity on the seashore. Peter and some of the others had gone out fishing in the night. Early the next morning, someone calls out to them asking about their success in catching fish. The man insists that they throw their nets on the right side of the boat to find fish which they did. Upon hearing one of the disciples say that the person was the Lord, Peter jumps into the water and hauls the net of fish to shore. Jesus, later, pulls Peter aside after breakfast to offer him reconciliation. Isn’t the fact that Peter denies Jesus three times interesting in light of Jesus asking Peter if he loves him three times? Many scholars believe Jesus intentionally asked Peter the question three times in response to his three denials. Another interesting Greek word play also takes place in this passage. In the first two questions that Jesus asks Peter; “do you love me”, Jesus uses the Greek word agapao for love. The third question and in every response that Peter gives Jesus, the Greek word used for love is phileo. Agapao is an unconditional love that is a deliberate assent of the will, a choice made, a love of best interest for a person. Phileo, on the other hand, is love for a friend, an affectionate love that comes from the heart. Peter was restored into fellowship with his friend but still had much to learn about following him as his Lord and Savior. Next Monday, we will continue our study of Peter with his time after the Ascension of Jesus. What can I learn about faith from the life of Peter? What do I learn about friendship with Jesus from Peter’s experience with him? Am I bold in my faith? How can I strengthen my faith so I don’t falter in times of difficulty?